(Tech Xplore)—Interested in an immersive personal theatre headset? We're talking about that magic world that overtakes yours on the giant screen—but minus popcorn littered aisles and a five year old kicking your seat from the row behind. 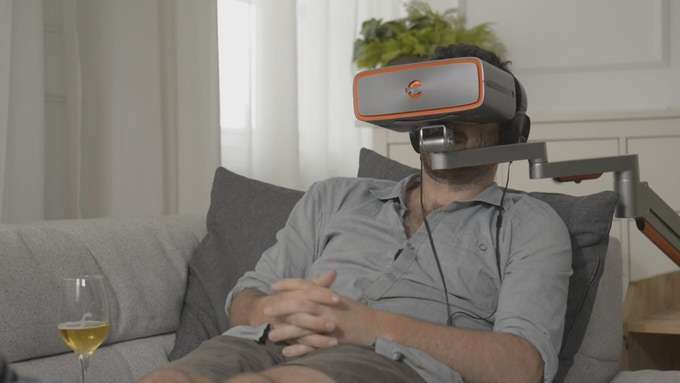 Then you might want to check out Cinera's headset, as Cinera has a campaign running on Kickstarter. Cinera, Inc., is incorporated in Newark, Del., with corporate offices in Hong Kong. The pitch: "Imagine standing in the center of your favorite film. The action happening all around you, sound flying past your ears." There is an extra pitch too: "Instead of asking how we can make your home cinema more like a movie theater, we asked how we could make your home movie-watching, show-streaming, video-gaming experiences better?" In other words, it is not just the movie-house experience they offer but "all your favorite media." New Atlas: "HDMI, USB and Micro USB inputs allow content to be sourced from a variety of devices, from a gaming console to a Blu-Ray player. The system also runs on Android and is Wi-Fi-enabled, meaning you can watch Netflix and other streaming services directly through the headset." It also means you can watch 3-D media. In promoting the features, Cinera' s team said it is even better than watching 3-D in the movies, and the qualitative difference is in the display system. With their display system each eye has its own individual display panel and light path, with no filter and no loss of quality. "So you can enjoy brighter, more vivid 3-D images," they said. To give the illusion of 3-D, said the team, most movie theaters project two distinct images onto the same screen through polarizing filters. "Your big, plastic glasses filter out the images so one eye sees only one version. In this process, you lose more than 75% of the light—and the images never quite match up." "The headset has dual 2560 x 1440 displays and a wide 66 degree field of view, which the creators compare to an IMAX theater experience. It can play standard or 3-D movies over HDMI, or through the built-in Android OS. " A burden-free arm is in the mix; this is an adjustable 'arm' that holds the headset in front of the eyes without weighing down the user's head. Rich Haridy in New Atlas: "Although Cinera can come with an optional head mount, the makers recommend using the supplied 'burden free arm' that holds the unit in front of your face without weighing down your head. Anyone who has spent more than 10 or 20 minutes wearing a modern VR headset will immediately recognize the benefits of this design detail." What is Cinera's current project status? "We've produced about 50 prototype/test units to iron out all the potential challenges in assembly," and they expect mass production in November. They said they were confident the headsets will be shipped by Christmas. The pledge of $449 at the time of this writing was for one of the headsets, a power-charger and burden-free arm. Tech watchers were impressed—and surprised themselves to be impressed. Using words like clunky, ridiculous, they also found the headsets alluring. Witness The Verge headline: "My face is ready for the Cinera." The Verge's Paul Miller described it as "an oversized personal theater headset attached to an articulated mechanical arm." The New Atlas comment was that unit was "undeniably weird-looking, and certainly not the future of home entertainment, but it could be a fun, immersive way to watch your favorite movie at home without spending thousands on a giant home entertainment system." Haridy said, "Billed as an immersive personal theater headset, it's basically like sitting really close to a tiny HDTV while wearing headphones to give the effect of sitting in front of a cinema-sized screen." The image is a bit unfortunate. Looks like it turned the viewer into a vegetable. ...I also wonder how the viewer will handle his glass of wine. I also thought he was wearing a small bush for a hat, or maybe that he wasn't finished putting on his whole ginny suit.